Above Board Chamber of Florida is proud to present “How to be Your Best Self in 2015” from 11:30 a.m. to 1 p.m. Monday, November 10 at the Hilton Naples and Thursday, November 13 at The Landings Yacht, Golf and Tennis Club in Fort Myers. As Businesses get more competitive in the coming years, it will become increasingly important to look our best and create a great first impression. You either define your own image, or others will do it for you! The Above Board Chamber’s panel of top experts will teach you techniques for speaking, acting and polishing your appearance so that everyone will want you or what you sell! The Naples meeting will be emceed by Sue Huff, owner of E. Sue Huff & Associates, Inc. Marketing and Management Consulting, and feature panelists including Christian Gehring, owner of Trini in Private Bell Tower; Tamra Nashman, president of Extra-Ordinary Image and fashion consultant at Fox 4; and Kay Bork, founder, fashion stylist and wardrobe consultant at Impressions. Registration on or before Friday, November 7 will be $25 for members and $28 for friends. After November 7, registration will be $28 for members and $33 for friends. Non-profits can put up a free table, and members can put up a table for $25.Attendees must RSVP for this event, which includes a plated lunch. Registration on or before Friday, November 7 will be $22 for members and $28 for friends. After November 7, registration will be $28 for members and $32 for friends. Non-profits can put up a free table, and members can put up a table for $25.Attendees must RSVP for this event, which includes a plated lunch. This Naples meeting is being sponsored by the Children’s Museum of Naples on behalf of The Arlington of Naples. Angela Mia DiLorenzo of Lifestyle Home Team is the sponsor for the Fort Myers meeting. For more information on the event visit the Above Board Chamber’s Facebook page. 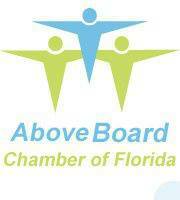 To become a member of the Above Board Chamber, contact Jeanne Sweeney at 239.910.7426.